Squash – Fun for al l ages……. 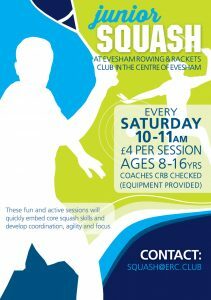 Junior squash is run every Saturday morning from 10 – 11 o clock. We currently cater for ages 8 – 16, although we are looking to start a ‘tots squash’ in the near future. Our sessions focus on the ‘pillars of squash’, e.g. eye-to-hand coordination (striking a ball), agility, tactics, fitness, whilst also building a good repertoire of shot types and knowledge of this amazing game. If you are interested please email us at squash@erc.club or alternatively just drop in for a nosey, we’re always happy to chat. Ideally we’d like to have the children ‘kitted-out’ correctly from the off, i.e. non-marking trainers, protective eyewear etc, but understand parents will need confidence that the child’s interest will continue. To help here we can provide eyewear and rackets, and are happy to overlook correct footwear for a couple of sessions.